If you were given the responsibility of attracting tourists to the Badlands, you might consider changing the name. Somehow, Badlands doesn’t sound as inviting as, say, Fountain of Youth, South Dakota. That area of the U.S. Great Plains has been called some version of “bad lands” since humans first encountered it. The Lakotas called the region mako sica — you can guess what that means. When French-Canadian trappers showed up centuries later, they made a similar assessment, calling it (in French) “bad lands to travel through.” Maybe it was the lack of water and shade, along with the volatile weather conditions, that gave them that impression. The jagged landscape probably influenced their opinion, too. It is undeniably rugged — but that is part of its appeal. The rock formations, the colorful peaks and gullies created over millions of years by erosion and other geological forces, are mysterious. Some people consider the Badlands a spiritual experience. It’s definitely unusual. Badlands National Park is about 80 miles east of Rapid City, South Dakota. Every few hundred yards along Interstate 90 are billboards for Wall Drug (in the town of Wall), but other than that, it’s wide-open prairie. The entrance to the park is a few miles off the Interstate and connects with Badlands Loop Road, which meanders through spectacularly stark scenery. There are numerous overlooks and trails just off the Loop Road; one of them features fossils of some of the beasts who lived here millions of years ago. Current inhabitants include bighorn sheep, coyotes and prairie dogs. In hopes of seeing some bison in their natural habitat, we left the main road and went a mile or two along a rutted gravel track called Sage Creek Rim Road. The noise our car generated must have scared off the bison, but we did see a lot of prairie dogs in the area. Obviously, the Badlands themselves are the main attraction; this is wilderness with an emphasis on wild. On the return to civilization, it’s probably worth stopping at Wall Drug, since it claims to be the world’s largest drug store. It was once a small establishment in a town of a few hundred people, but now occupies most of a block on Main Street. Apparently the owners gobbled up neighboring stores over the years. They probably fill an occasional prescription, but most of Wall Drug’s trade is in things like western wear and arcade games and souvenirs. They even have a traveler’s chapel, in case you’re seeking a spiritual experience in a drug store. Let’s just say it’s quite a contrast to nature’s vast cathedral down the road in the Badlands. 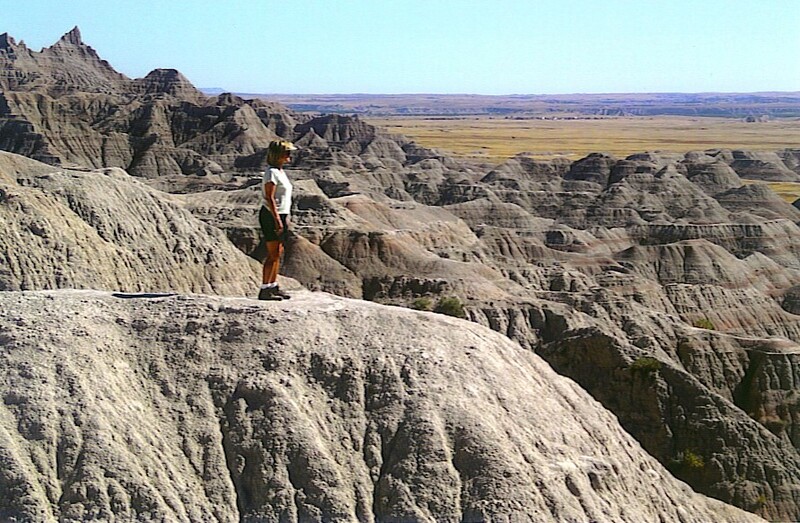 This entry was posted in Travel and tagged Badlands National Park, South Dakota, Wall Drug. Bookmark the permalink. Is Badlands Meanie anything like Yosemite Sam? Were there cartoon characters named for other national parks? I went to the Badlands in May of 2001 on a long road trip from North Carolina to Colorado for a summer job. The bison were everywhere in the park, couldn’t miss them. As I was planning my trip, friends told me to stop at Badlands on the road to Yellowstone. However, they warned if you were heading west to east and stopped at Yellowstone first, the Badlands would be disappointing. I’d say they were probably right. It was a neat stop for a day, but Yellowstone was mind-blowing in comparison, and is the trip I want to make again when my daughter is old enough. You’re right about Yellowstone being mind-blowing in comparison to the Badlands… and to almost every other natural wonder, for that matter. I think you’d agree, though, that there is something sort of other-worldly about the Badlands that make them worth a visit. Thanks for your comment! Are you thinking of Devils Tower in Wyoming? (That’s how they spell it, by the way, without an apostrophe.) It’s a giant hunk of rock in a fairly stark landscape. Nope. Really, it was like a pit half the size of a football field tucked behind a gas station in south/central Wyoming. Had to have been 5+ hours south east of Tetons National Park. I did see Devils Tower on my way to Yellowtone.